At Google, we believe that artificial intelligence can provide new ways of approaching problems and meaningfully improve people’s lives. That’s why we’re excited to support organizations that are using the power of AI to address social and environmental challenges. We’re looking for projects across a range of social impact domains and levels of technical expertise, from organizations that are experienced in AI to those with an idea for how they could be putting their data to better use. Since 2005, Google.org has invested in innovative organizations that are using technology to build a better world. Impact. How will the proposed project address a societal challenge, and to what extent? Feasibility. Does the team have a well-­developed, realistic plan to execute on the proposal? Scalability. If successful, how can this project scale beyond the initial proposal? Responsibility. Does the proposed use of artificial intelligence align with Google’s AI Principles? After the deadline, Google and our panel of experts will review proposals and announce grant recipients in spring 2019. 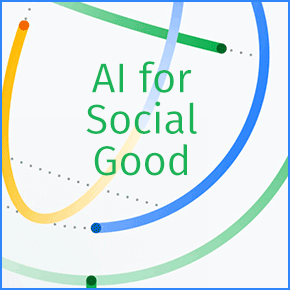 Selected organizations will receive support from Google’s AI experts, Google.org grant funding from a $25M pool, credit and consulting from Google Cloud, and more.